If you’ve never been to a physiotherapist before then you may be wondering what to expect from your physiotherapy consultation. These are designed for anyone with a musculo-skeletal problem who has not already had the problem assessed at Body Works, or who has not been seen in the clinic for over 6 months. We know that it is vital to allow sufficient time to be able to form a strong physio/client collaboration and be able to provide a first class service, which is why our initial appointments usually take between 45 minutes to an hour. In the assessment we will thoroughly discuss the symptoms you are experiencing, along with any concerns and anxieties you may have about them, carry out an in depth examination and allow time to discuss our findings with you. Then we will formulate an agreed plan of action with you, discuss your treatment aims and begin a treatment programme. Our initial physiotherapy assessments are £47. These sessions typically last for about half an hour. We will check how you are progressing, continue with any agreed treatments such as joint mobilisations or manipulations, soft tissue techniques or acupuncture. Teach exercises as required, offer advice and reassurance. We aim where possible, to get you to a point where you are symptom free and able to return to your usual activities/sport/work. However, if we don’t think this is achievable, we will let you know. We will always give you self-management strategies too. These may involve exercises, postural advice and lifestyle adjustments to help you take control of your symptoms. We believe that information is empowering and will provide you with as much knowledge about your condition as possible. Our follow up physiotherapy appointments are £37. Occasionally people find it beneficial to come into the physiotherapy clinic for top-up or maintenance sessions. 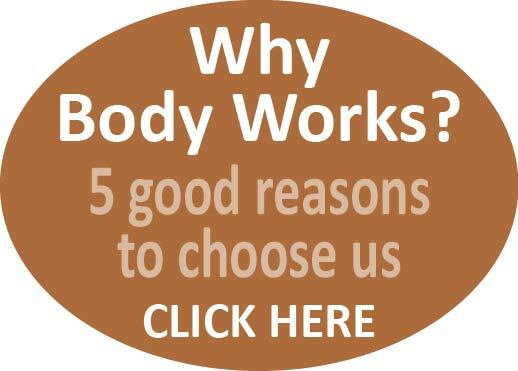 These may help you if you have a chronic or long term problem causing pain, stiffness or mobility problems and have previously been treated at Body Works. These sessions allow you to touch base with your physiotherapist for hands on treatment, acupuncture, exercise or lifestyle advice, motivation or reassurance. As with the follow up sessions these typically last for half an hour.